Nearly a month has passed since my last race and last post. Summer has been busy with the kids’ activities, family logistics, and a few work things plus of course, training! Training often seems like the “warp” to support the rest of my life’s “weft”. It gives me the structure and discipline to make it all work and keep me relatively at peace. With the summer schedule and weather, we've upped my swimming some and I’ve had a few great open water swim (OWS) opportunities. 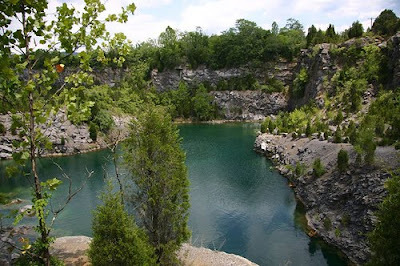 My friend Laura was training for her first triathlon, an Olympic distance race, and her partner owns land about 10 minutes from my house with a decommissioned rock quarry that serves as a freshwater swimming hole. 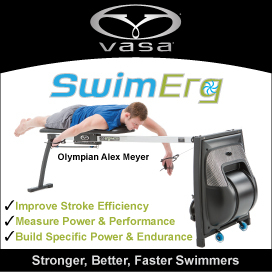 The area swim program uses it and it’s set up with buoys that make a nice 450-500m loop. She invited me to swim on a recent warm sunny day and it was one of the most awe-inspiring experiences I’ve had in some time. I’ve never seen light refracted in water in such a beautiful way before. The water was warm and clean with some friendly fish who hung out with us afterward. I did a 30 minute continuous swim that amped up my confidence some. I snagged these from online since I didn't have the sense to take my camera on the one non-rainy swim. The water is, I'm told, much higher this summer. Twice I’ve gone with my friend Krista, who is training for a 1 mile OWS in Vermont, to Claytor Lake, about a half-hour drive from Blacksburg. Her friend Ellen kayaks/lifeguards along side to keep an eye out for boats and jetskis. The first time I went with them, the water was very choppy, but surprisingly I rather enjoyed it and discovered I could swim OK in chop. The funny thing is I had something pinched in my neck and really could only turn my head one direction which made bilateral breathing not an option! The second trip to Claytor Lake was much smoother. We swam following the shoreline and headed out about ¾ of a mile, stopping every so often to regroup and chat (we are girls, after all!). On the way back, we never stopped. The cool thing was we hadn’t really planned how it would go but we seemed to be in sync. Krista was a machine and I practiced drafting off of her feet and hip and worked on more efficient sighting. We spent 75 minutes in the water, most of it swimming. I couldn’t believe it. 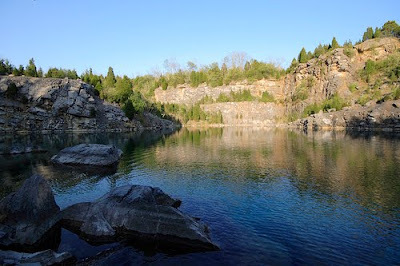 Last week I returned to the quarry with Jim and three other triathletes. After weeks of drought, THIS was the day the rains returned! We began in a drizzle and finished in a downpour. We played a few games of what was essentially water chase and also did some laps. They were all pretty speedy swimmers and it was at once inspiring and humbling. 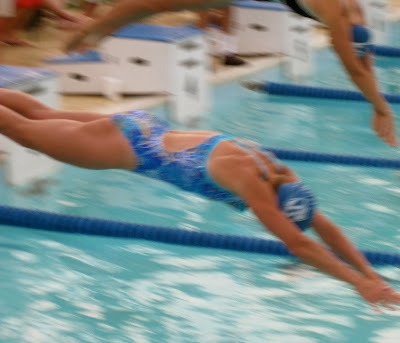 Then just for fun, and to show the kids I know what they are going through, I competed in three of the summer swim meets – 50 free, 100 free, and 50 breast. I’ve knocked some time off of each since last summer. This summer's bests are a 32.10 50 free; 1:13.25 100 free; and a 40.31 50 breast. Even BETTER is that the kids seem to be pretty self-motivated. They asked for some help with technique and I can at least give some rudimentary advice and help…on everything but butterfly. They have each made significant gains in speed and are enjoying the feeling of success.